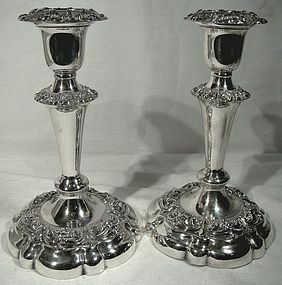 A pair of Ellis-Barker silver plate 7" candlesticks with bobeches circa 1910. These finely detailed candle holders have their original removable bobeches, and they have the Ellis Barker EPNS pineapple mark in use from 1906-12. These table decorations are in excellent condition with no dents, bends, corrosion, losses, damage or repairs other than the loss of the bottom felt, which can easily be replaced. All items are thoroughly and conservatively graded and all condition issues are noted; all items are vintage or antique and may have slight signs of gentle use. Expedited tracked insured parcel shipping to the U.S. starts at $23 (other spots may vary, air is higher). Items paid with a credit card will be shipped to confirmed addresses only. We do ship internationally. All of our prices are in $US. PLEASE NOTE: we DO NOT accept PayPal, only VISA and MASTERCARD. 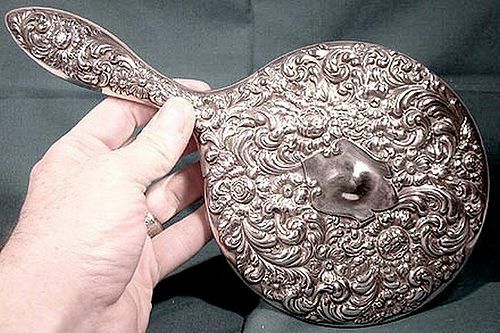 A Victorian sterling silver ornate floral hand mirror circa 1890 1900. This antique 10-1/2" x 5-3/4" dresser set piece has a she ield cartouche that has not had a monogram. The silver marks are usually found near the base of the mirror at the handle, which in this case appears to have been shortened slightly, you can see a separate line, obscuring the hallmarks. The mirror was tested and it does test as sterling silver. Greatly resembles older Kirk or Steiff silver. This item is in very good condition with no chips, cracks, corrosion, losses, damage or repairs other than some edge denting, a pushed in area on one side of the handle, and some silvering loss to the mirror back (can be re-silvered). All items are thoroughly and conservatively graded and all condition issues are noted; all items are vintage or antique and may have slight signs of gentle use. Expedited tracked and insured parcel shipping to the U.S. starts at $20 (other spots may vary, air is higher). Items paid with a credit card will be shipped to confirmed addresses only. We do ship internationally. All of our prices are in $US. PLEASE NOTE: We DO NOT accept PayPal. An Empress Gloss papier mache advertising box circa 1890-1900. This German box has a fancy script "EMPRESS" GLOSS gold advertising decal on the lid. This 6-1/4" x 2-1/4" box has a black lacquer exterior and a red interior, and the lid is hinge-mounted. It is stamped "PAPIER MACHE" MANUFACTURED IN GERMANY on the bottom. We were unable to find out any information on the product or company, but the polish for Victorian period leather boots was typically known then as shoe gloss, so possibly this was for a shoe polish product. This item is in excellent condition with no chips, cracks, crazing, losses, damage or repairs other than a few tiny flakes to the lacquer on the lid's edge (one visible, three under the lip) and some minor losses to the shiny gloss on the surface (very slight). All items are thoroughly and conservatively graded and all condition issues are noted; all items are secondhand and may have slight signs of gentle use. Expedited tracked shipping to the U.S. starts at $20 (other spots may vary) - insurance and tracking included is shipping quotes, which very by destination. Items paid with a credit card will be shipped to confirmed addresses only. We do ship internationally. All of our prices are in $US. PLEASE NOTE: we DO NOT accept PayPal, only VISA and MASTERCARD. 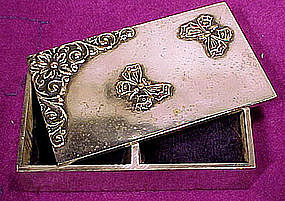 An interesting antique silver plated pinioned-lid stamp box c1880-1890. This 2-5/8" x 1-1/2" unsigned box features a floral corner applique and two applied butterflies on the top, a pin stop and corner swinging pivot. The interior has remnants of what appears to be adhesive from some missing material and it has two cutout felt pieces; it would make a nice tiny jewel box also. This item is in excellent condition with no dents, bends, corrosion, losses, damage or repairs other than a slight blush of brass on the applied sections and some minor roughness to the top's silver plating. All items are thoroughly and conservatively graded and all condition issues are noted; all items are secondhand and may have slight signs of gentle use. Small packet surface shipping to the U.S. starts at $6.95 (other spots may vary) - insurance is included in shipping quotes. Items paid with a credit card will be shipped to confirmed addresses only. We do ship internationally. All of our prices are in $US. PLEASE NOTE: We DO NOT ACCEPT Paypal, only VISA and MASTERCARD. 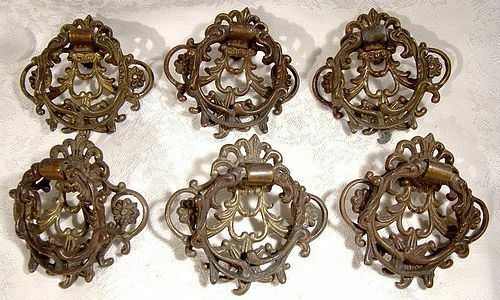 A set of six cast gilt brass drawer pulls from the 1900 era or slightly earlier. Each measures 3-1/8 x 3" and they retain their original screws and washers; four are slightly curved and two are flat (probably for a bottom drawer). Each has traces of the original gilding and the loops on each have a red patina while three (two curved, one flat) have traces of red on the backing plates (possibly from a painted piece). They are unsigned, and they are in excellent original condition with no cracks, dents, bends, corrosion, losses, damage or repairs. All items are thoroughly and conservatively graded and all condition issues are noted; all items are secondhand and may have slight signs of gentle use. Tracked packet insured air post to the U.S. is $15 (other spots may vary) - insurance is included. Items paid with a credit card will be shipped to confirmed addresses only. We do ship internationally. All of our prices are in $US. Please note that we do not accept Paypal.